Joe here! 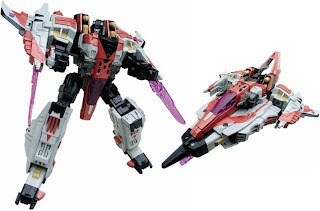 Today we're taking a look at the next figure in line in my look at the Transformers-Generations Fall of Cybertron themed deluxe figures; the traitorous sycophant, Starscream. This version of Starscream is a faithful representation of his appearance in High Moon's Fall of Cybertron game. But, does this Starscream take over on my shelf, or does he just get ghosted? Take a peek after the jump! Way back when, in the G1 days, we found that Megatron's second-in-command wanted nothing more than to lead the Decepticons. Starscream would take advantage of even the smallest opening he got to wrest control from Megatron. At one point, even using the excuse that Megatron couldn't talk as the reason he should lead. Starscream was a fantastic character; always trying and failing, but never giving up on what he wanted. For some reason, hearing that he and Cobra Commander shared the same voice, that of departed actor Chris Latta, gave Starscream even more weight as a character that you just loved to despise. Both characters were so slimy and self serving yet always failing comically. It was really no surprise that Starscream would eventually meet his end, and did at the hands of Galvatron in the '87 movie. Starscream comes packaged in the standard red card that has been the norm for the Generations line. The top of the card has some beautiful character art of Starscream from FoC. The insert of course, has a shot of Starscream's Alt-mode. The back of the card give us the normal shots of Bot and Alt modes, notes about the figure and his accessory, a Bio, and a Tech-Spec. Release Starscream from his plastic prison and we find the standard plastic tray, paper ties, and folded instructions. Starscream is a very accurate representation of his on-screen look. He comes molded primarily in grey plastic with some red and blue parts. Mine has some really crisp paint apps... especially those that are more pink to represent the Energon glow that runs through the figure. Transforming Starscream to Alt-mode is not all that tough. I was able to figure him out with no help from the instructions... unlike Kickback. Start by rotating his head to face backwards. Pull the entire back assembly away from the chest. The tricky part here is getting the grey pieces that make the shoulders to flatten out. Once flattened out, the two pegs from the rear of the shoulders peg into place and the red intakes peg into those. Swing the entire assembly vertically. Starscream's arms fold into the underside of the assembly at the shoulders. Make sure to rotate the arms so that they can be folded at the elbow down and into the Alt-mode. There is tab and slot on the forearms that will help keep the arms together. Midway through the body is a hinge which is the point at which the body will fold in on itself. Fold the lower body and legs under the top of the Alt-mode. The two small grey pegs on the underside of the back plate plug into the post holes on the back of the legs. Finish off the transformation by folding in the 'toes' and folding out the nose of the Alt-mode. Starscream's Cybertronian Jet-mode gives us an updated look to Starscream while giving homage to the original, triangular body Seeker form from the G1 cartoon as well as the Cybertron Supreme scale Starscream. All this one needs, is a crown. Starscream comes packed with a clever little weapon. I like when weapons have a gimmick. Well... a gimmick like this... I don't need shooty gimmicks. The weapon, as it's packed, is a dual mini-gun. The weapon barrels are seated on cogs with teeth on them; spinning one barrel causes both to spin. I love me some min-guns... thank you Blaine and 'Ol Painless. The weapon can also be split into 2 separate mini-guns. For Starscream's Alt-mode, the mini-guns fit best under the wings while separated. There is a post hole under each wing to attach them to. In Bot-mode, the mini-guns can be attached and then fit into Starscream's hands. I also went with a more classic look and mounted them into the post-holes on his forearms. Of course, I couldn't have FoC Starscream out and not retrieve my Classics G1 Starscream and shoot a few pics. Mostly just a weapon swap to give FoC Starscream the classics weapons. While the Classics Seeker mold has seen it's fair share of repaints, it is still a very solid mold. All in all, FoC Starscream is a solid figure. His transformation isn't too complex and he looks great in either mode. I would have preferred the more classic weaponry rather than the over-sized FoC mini-guns... but none-the-less, he still looks great. As far as I'm aware, we won't be getting any Thundercracker or Skywarp repaints here in the US of this mold, which is disheartening. I'd love to get a few more of these to repaint, but who am I kidding... I'm just too lazy. Pics, gloating, and traitorous underhandedness by Scion of Primus. Ok, I've been able to resist these FoC figures so far, but I don't think I can pass Screamer up. I need this guy on my desk.